Gorgeous selection of designs to have in an A5 pocketfolder with an invitation, details and RSVP cards inside, secured with a personalised belly band. Simply use the drop down option menus to select the design, (have a look at our range of different designs under ‘view all products from this seller’) card stock, colour of pocketfold and printed colours. If you want any other adjustments, just let us know. If you have any questions or problems, just contact us. 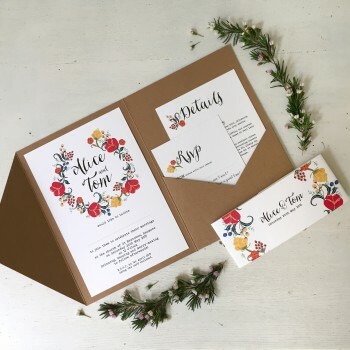 Choose one of our gorgeous designs and the colour scheme to fit your wedding style and then choose from a Ribbed Kraft pocketfold or from an amazing array of colours to really personalise your finished invitation. You can choose to have the invitation, RSVP card, details card and belly band printed on white, ivory or cream card and a matching white, ivory or cream envelope is also included in the price. If you choose a Ribbed Kraft pocketfold, we would usually supply a Ribbed Kraft envelope to match but it is up to you. You could also add an envelope liner to reinforce your colour scheme but PLEASE NOTE, THE LINERS CANNOT BE USED WITH RIBBED KRAFT ENVELOPES. The invitation is fixed to the inside front of the folder, with the RSVP card and details card sitting neatly in the pocket. The RSVP card is printed on the reverse with your address and space for a stamp so all your guests need to do is fill it in, stick on a stamp and post it back! The belly band can be personalised with whatever you like - the couple’s names and wedding date, ‘Wedding Invitation’ and the date or you can even put your guests names on them to save you writing everything out inside! Once you’ve placed your order, we will be in touch to clarify the wording etc. We can design something bespoke, so just let us know your ideas and we would love to create your vision! Once your order has been placed we will be in touch to discuss the wording and any other options you would like on your stationery. We will then send you a sample of exactly how your finished stationery will look. From there, PDF proofs will be emailed to you to finalise the details. Once you have approved your design, we aim to deliver within 3 weeks. However, if you need your order quicker than that, please let us know at the time of ordering and we will endeavour to meet your deadline. Orders will be sent via Royal Mail First Class Signed For delivery. A beautiful, vintage-style design, given a modern twist. This Winter Glamour design can be adjusted ..